The Sidebar: Business Insider story deals death blow to my dad's hokum about back blows -- and opens the door to further expose "the Koop maneuver"
Business Insider story deals death blow to my dad's hokum about back blows -- and opens the door to further expose "the Koop maneuver"
A news video published yesterday by Business Insider dealt another blow to my father's fraudulent 40-year campaign which he called, "back blows are death blows." The story also tagged this 1982 research study by three Yale physicians which my father clandestinely funded. My wife Karen and I uncovered that scam which we helped bring to public attention via a first-rate 2006 New Haven Register expose by veteran medical journalist Abram Katz. 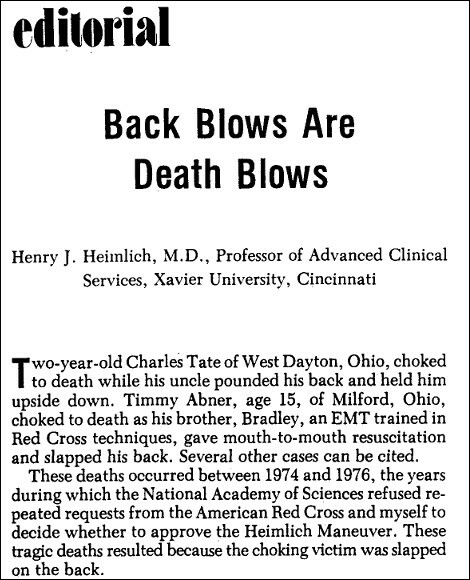 (Dr. Heimlich) even funded a study in the '80s that showed back blows could do more harm to a choking victim than good. But in truth, there is no valid scientific evidence to prove that back blows are any better, or worse, than the Heimlich maneuver. Even after being busted for that mess, dad kept slinging his anti-back blows hokum, but the only reporter still willing to provide him with a platform was Cliff Radel at the Cincinnati Enquirer. The Business Insider story also opens the door for more reporting about "the Koop maneuver." 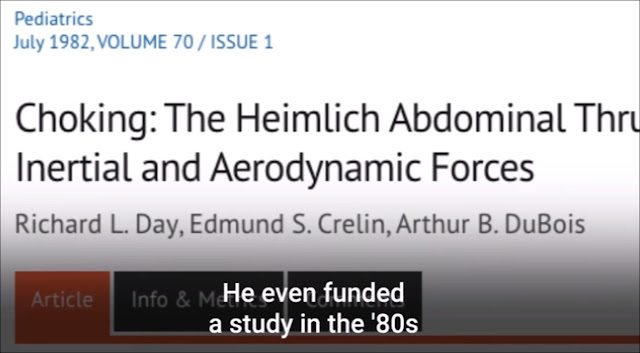 Surgeon General C. Everett Koop today endorsed the Heimlich manuever [sic], not as the preferred, but as the only method that should be used for the treatment of choking from foreign body airway obstruction. Dr. Koop also urged the American Red Cross and the American Heart Association to teach only the Heimlich Manuever [sic] in their first aid classes. Dr. Koop urged both organizations to withdraw from circulation manuals, posters and other materials that recommend treating choking victims with back slaps and blows to the chest. ..."Millions of Americans have been taught to treat persons who are choking with back blows, chest thrusts and abdominal thrusts," Dr. Koop said. "Now, they must be advised...and I ask for the participation of the Red Cross, the American Heart Association and public health authorities everywhere...that these methods are hazardous, even lethal." A back slap, the surgeon general said, can drive a foreign object even deeper into the throat. Click here for Koop's two-part published statement which, like the press release, repeatedly misspells the word maneuver. Per the Business Insider, there has never been any evidence that back blows are ineffective or dangerous. Same goes for chest thrusts. 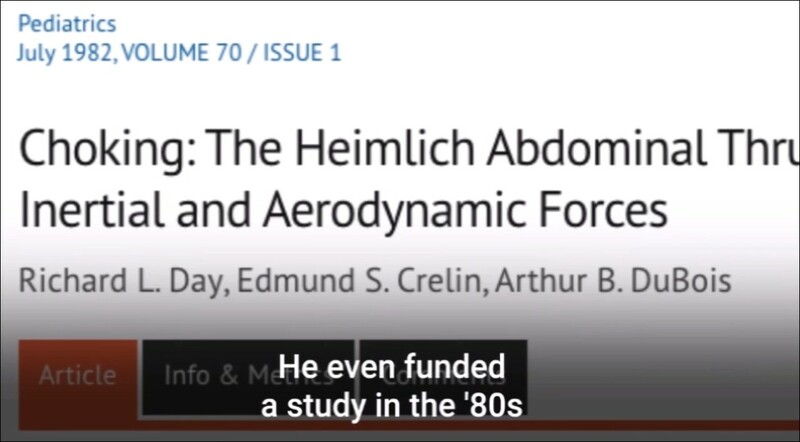 In fact two studies concluded that they were more effective than "the Heimlich." So why did Koop use his bully pulpit to circulate false information? 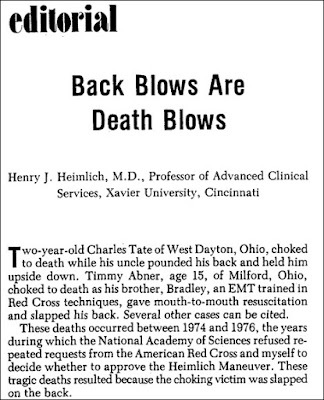 Back blows are "death blows," Dr. Heimlich declared long and loud as he lobbied for his maneuver's acceptance 30 years ago. In 1985, Surgeon General C. Everett Koop endorsed this view, dubbing backslaps "hazardous." After that, only the Heimlich Maneuver was considered kosher. More about Dr. Koop's misleading statement via Heimlich Maneuver Endorsed by Cristine Russell, Washington Post, October 2, 1985.